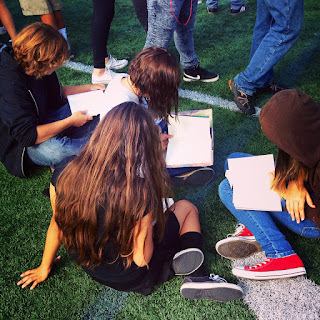 Reading during the fire drill. 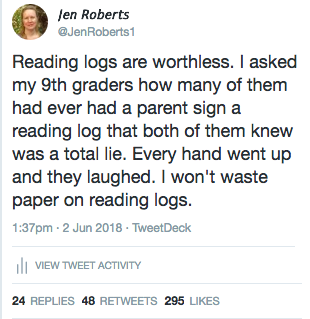 About 24 hours ago I wrote a tweet about why I don't use reading logs with my students. I think the "what to do instead?" question comes from the assumption that there needs to be some accountability for reading, that if we, as teachers, aren't checking, then students won't be doing any reading. What implicit message does that send to our students? That reading is so awful we assume they are not doing any unless we hold them accountable? My amazing PLC team has a lot of conversations about this, the tension between wanting to build a culture of reading among our students where we read because it's enriching and enjoyable, and wanting some accountability to help motivate those who wouldn't read much without some requirements. We know we have some students who will read no matter what because they are already life long readers. We also know we have many students who have lost their love of reading, or never found it to begin with. And, we have a large percentage of students (in the fall) who are just indifferent to reading. In September I surveyed my students about reading. One of the questions was how much do you like reading on a scale of 1-5, one being low, 5 being high. The majority gave it a 3. Challenge accepted. Entire books have been written about building a culture of reading, The Book Whisperer, by Donalyn Miller being one of my favorites. When my classroom got 1:1 computers though, I found some additional ways to leverage tech to support reading and gather useful information about my students' reading. These are some of the strategies I use to build a culture of reading and include accountability for reading within that in a way that does not devalue reading. I teach 9th grade English to about 140 students. I need strategies that are individual and things that scale to give me information about lots of students at once. None of these require buying anything, except books of course. I talk to my students about their reading. Conferring one on one is the best way to know my students as readers. Sometimes those conversations are intentional, other times they are more casual, and often they are transactional, like when a student needs help finding a new book. My conferences rarely happen during silent reading though. When our class is quietly reading even a low conversation is distracting to too many students. I'll wait until the class is working on something to confer. Some productive buzz in the room makes teenagers less self-conscious about conferring. 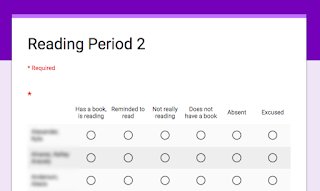 Every few weeks I ask students to complete a Google form that asks for the title of the book they are reading, their current page number, how much they like the book, and a few sentences summarizing just what they read that day. It takes them five minutes during class. No paper to loose. No parent signatures to forge. From the data I can see who does and does not like their book, and who is and is not making progress. I can target my conferences to those people. You can have a copy of my reading progress update form. Giving my students ten minutes to read at the beginning of class is essential. I know for some it is the only ten minutes they may read that day, and I know that makes a difference. For lots of others it is the time they need to get engaged with their book until they are hooked enough to read more on their own. 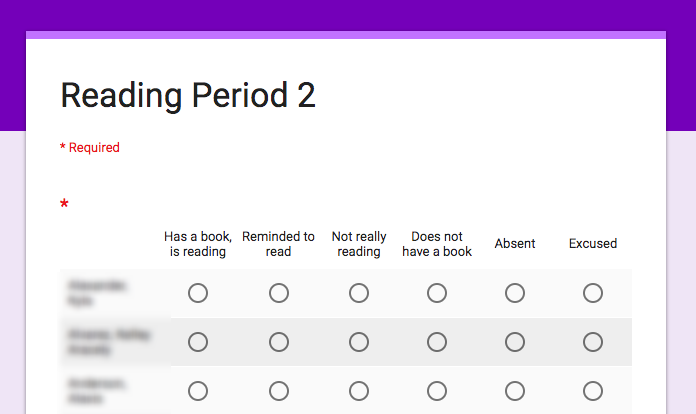 Several days a week I'll use a reading observation form as I take attendance. It's a form that has all my students names and buttons next to each one to describe their reading behaviors that day. With just a few seconds of observation I can see which students are really engaged with their books and who is fake reading. The form helps me track the data and when I see a trend I can intervene sooner. My students have no idea I do this. When I use the data to confer with them I say things like, "My notes show you haven't been engaged with your book lately. Do you need a different one?" We do a lot of things about books. We have a book socratic where students prepare discussion questions based on themes from their books and then talk about those big ideas. You can have a copy of their preparation form. We do book reviews in Flipgrid. Just recently we created book recommendation slides. Second semester I introduce Reading Challenges to get students out of their bubble, and I show them that the issues they care about now have a history they can read about in diverse historical fiction and nonfiction. There are lots of other things I have done and could do. Obviously, one can't do everything. These are the things that I chose for my students for this year. I still have students who don't read and I still have the students who read above and beyond my expectations, but for that majority in the middle, we have created a culture that values and encourages reading. Many of them rediscover that they like reading. They read more than before outside of school. They have favorite authors, they've tried new genres. They know what they like to read. I think that's way better than a stack of fraudulent reading logs.